Arts in the Square, in Frisco Square, is an annual juried fine arts and crafts festival, celebrating its 10th year, featuring over 120 of the best local and regional artists selling their handmade creations. 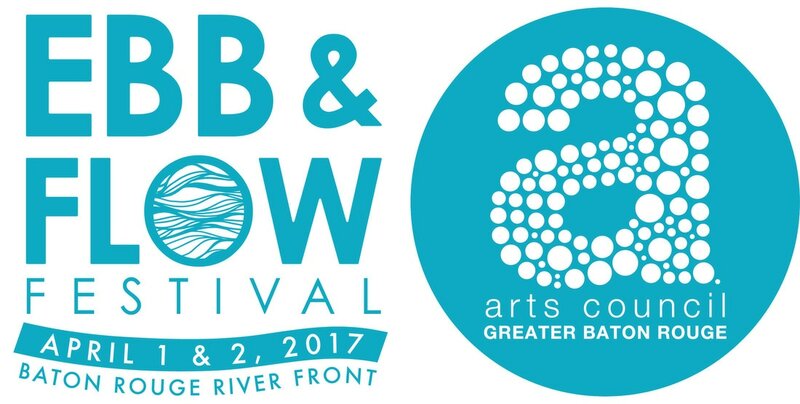 Saturday, March 30, 11 a.m. – 6 p.m.
Sunday, March 31, 11 a.m. – 6 p.m.
Ebb & Flow is a two-day outdoor festival in the heart of downtown Baton Rouge that celebrates the capital region’s cultural, economic, and ecological connection to the Mississippi River and all things that ebb and flow. Saturday, April 6, 11 a.m. - 7 p.m.
Sunday, April 7, 12 p.m. - 6 p.m.
​This event consists of approximately 190 art and craft exhibitors. The first Fair was held in 1968 and today approximately 40,000 visitors attend on the final Saturday of the 11 days of “Fiesta”-- San Antonio's biggest and most well-known festival. ​Saturday, April 27, 9 a.m. - 6 p.m.
​First Saturday Arts Market, established in 2004, is a monthly outdoor fine arts event, featuring the works of dozens of visual artists. The event is located in the historic Houston Heights at 540 W. 19th St. at Lawrence St.
Saturday, December 1, 11 a.m. - 6 p.m. The ninth annual Friendswood Art in the Park Festival, held at Stevenson Park, features talented artists and musicians, great food, artist demonstrations and free art activities. Saturday, November 17, 10 a.m. - 7 p.m.
Sunday, November 18, 11 a.m. - 5 p.m.
November’s often glorious weather and the picturesque, historic buildings of downtown Covington provide a beautiful backdrop for the arts festival that attracts as many as 50,000 visitors each fall. Saturday, November 10, 10 a.m. - 5 p.m.
Sunday, November 11, 10 a.m. - 5 p.m.
​Art @ Discovery Green is a celebration of the visual artist with 75 fine art and contemporary craft artists showing and selling their original works. Guests will enjoy strolling the artist booths hunting for that perfect piece for their collection or unique and original gifts for the holiday season. Friday, November 2, 5 p.m. - 10 p.m.
Saturday, November 3, 10 a.m. - 6 p.m.
Sunday, November 4, 10 a.m. - 5 p.m.
​Started in 1976, Huffhines Art Trails has grown since its humble beginnings to become one of the best arts and crafts shows in North Texas! Huffhines is a two-day festival held outdoors in Richardson, Texas, just minutes north of Dallas. Every year during the 4th weekend of October, the paved trails of Huffhines Park come alive with close to 150 exhibiting artists and craftsmen. 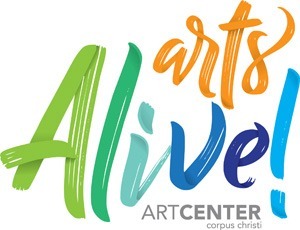 Saturday, October 27, 10 a.m. - 6 p.m.
Sunday, October 28, 10 a.m. - 5 p.m.
Saturday, October 6, 9 a.m. - 5 p.m.
​Arts Alive 2018, located on the Bayfront, is a celebration of the visual and performing arts, hosted by the Art Center of Corpus Christi, in the heart of the Marina Arts District. Arts Alive is an exciting weekend of all things art - fine art, interactive experiences, demonstrations, performances, music and workshops. Saturday, Sept. 1, 10 a.m. - 5 p.m.
Sunday, Sept. 2, 10 a.m. - 5 p.m.
​White Linen Night was patterned after a similar event in The French Quarter Arts district in New Orleans where residents came out dressed in their white linen finest to see local art. Come out and visit. ​Saturday, August 4, 6-10 p.m.
First Saturday Arts Market, established in 2004, is a monthly outdoor fine arts event, featuring the works of dozens of visual artists. The event is located in the historic Houston Heights at 540 W. 19th St. at Lawrence St.
Saturday, June 1, 6-10 p.m. The Omaha Summer Arts Festival, named one of “The Top 100 Fine Art Fairs” by Sunshine Artist Magazine in 2016 and one of the "Top 20 Can't-Miss Summer Festivals" by Smithsonian.com in 2014, is one of the finest in the Midwest. Attracting more than 80,000 patrons from throughout the region. This professionally managed arts festival features 135 juried artists from across the country exhibiting and selling their fine art and contemporary crafts in 14 media categories. Friday, June 8, 11 a.m. - 8 p.m.
Saturday, June 9, 10 a.m. - 8 p.m.
Sunday, June 10, 10 a.m. - 4 p.m.
​The Allen Arts Festival is an annual event that takes place the second weekend of May. This family friendly arts festival features juried artwork from fine visual artists in 14 media categories from all over the country, and has been a staple in Watters Creek at Montgomery Farm in Allen for the last 9 years. Friday, May 11, 4 - 8 p.m.
Saturday, May 12, 10 a.m. - 8 p.m.
Sunday, May 13, Noon - 6 p.m.
​​The Turtle Creek Spring Arts and Craft Festival will showcase approximately 125 local and regional artists and crafters of all disciplines at the historic Reverchon Park, in Dallas, Texas, that is just steps away from the Katy Trail. 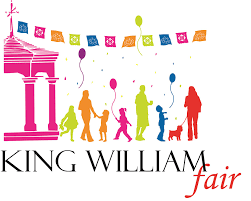 ​Saturday, April 14, 10 a.m. – 5 p.m.
Sunday, April 15, 11 a.m. – 5 p.m.
​This event consists of over 190 art and craft exhibitors, and over 30,000 visitors are expected to attend this fun-filled, family festival just as they have on the final Saturday of Fiesta each year since 1968. ​Saturday, April 28, 9 a.m. - 6 p.m.
​The City of Gulf Breeze and Gulf Breeze Arts, Inc. (GBA) are proud to host the 24th Annual Fine Arts Festival “Gulf Breeze Celebrates the Arts. The Festival is a juried fine arts and fine crafts festival that brings together quality local, regional, and national artists to Gulf Breeze, Florida. 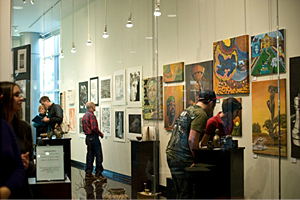 The two-day family event includes over 140 artists. ​Saturday, March 10, 9 a.m. – 5 p.m.
Sunday, March 11, 10 a.m. – 5 p.m.
​Arts in the Square, in Frisco Square, is an annual juried fine arts and crafts festival featuring over 120 of the best local and regional artists selling their handmade creations. ​Saturday, March 24, 11 a.m. – 6 p.m.
Sunday, March 25, 11 a.m. – 6 p.m.
​The 8th annual Friendswood Art in the Park Festival held at Stevenson Park features talented artists and musicians, great food, artist demonstrations, and free art activities. Saturday, November 18, 10 a.m. - 8 p.m.
Sunday, November 19, 11 a.m. - 5 p.m.
​​The inaugural Turtle Creek Arts Festival, a new, two-day arts festival, will debut in Reverchon Park in Dallas, Texas. The festival will showcase approximately 100 local and regional artists and crafters of all disciplines at the historic park that is just steps away from the Katy Trail. ​​Art @ Discovery Green is a celebration of the visual artist with 75 fine art and contemporary craft artists showing and selling their original works. Guests will enjoy strolling the artist booths hunting for that perfect piece for their collection or unique and original gifts for the holiday season. ​​​The downtown festival is one of the top outdoor fine arts festivals in the nation. The two-day festival showcases the works of over 300 of the finest artists in the world. The outdoor event brings out more than 20,000 people into the iconic skyline of Downtown Houston offering visitors the opportunity to meet with exhibiting artists, and enjoy food and entertainment. 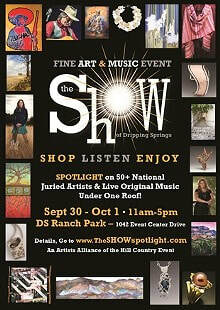 ​The Shops at La Cantera Art Festival is a juried art festival featuring 75 fine artists in 14 media categories. This is an art festival in an elegantly landscaped, tranquil environment and features the works of carefully selected local, regional, and national artists. ​The Artists Alliance of the Hill Country (AAHC) is spotlighting over 50 juried artists at The Show of Dripping Springs as a two-day Fine Art Event. Artists will display their work in the 12,000 square foot air-conditioned exhibition hall with musicians performing original songs on stage throughout the two-day event. August 5, 6 - 10 p.m.
​It's that time of year again to have fun and shop local at the 45th annual Tomball Night! Friday, August 4, 5 -1 1 p.m.
​Now in its 47th year, the semi-annual Cottonwood Art Festival is a juried show. Jurors have selected over 240 artists from 800 submissions to exhibit their museum-quality work at the festival. The artists compete in 14 categories: 2D Mixed Media, 3D Mixed Media, Ceramics, Digital, Drawings/Pastels, Fiber, Glass, Jewelry, Leather, Metalwork, Painting, Photography, Sculpture and Wood. Rated as one of the top art festivals in the United States, the prestigious show is the premier fine art event in North Texas. ​Saturday, May 6, 10 a.m - 7 p.m.
Sunday, May 7, 10 a.m. - 5 p.m.
Saturday, April 1, 10 a.m. - 8 p.m.
Sunday, April 2, 12 p.m. - 6 p.m.
Friday, April 7, 11 a.m. - 6 p.m.
Saturday, April 8, 10 a.m. - 6 p.m.
​Sunday, April 9, - 10 a.m. - 5 p.m. The 2017 Arts Fest on April 22-23, 2017 takes place at the fabulous Waters Point Retreat in Wimberley, TX. You may know it as Rio Bonito. Right alongside the beautiful Blanco River, there will be plenty of room for artists, for parking, for musicians and relaxing as well as space for the Vintage Car Show! It's a short walk to town shopping and eating, or grab our shuttle to Wimberley Square. Saturday, April 22, 10 a.m. - 6 p.m.
Sunday, April 23, 11 a.m. - 5 p.m. I will be inside Jerry’s Artarama doing a live demonstration. Art @ Discovery Green is a celebration of the visual artist with 75 fine art and contemporary craft artists showing and selling their original works. Guests will enjoy strolling the artist booths hunting for that perfect piece for their collection or unique and original gifts for the holiday season. The art featured comes in many styles, colors, shapes and sizes from jewelry to furniture, paintings to sculptures all created by the showing artist using many materials including wood, glass, clay, steel and stone. ​November 5, 10 a.m. - 6 p.m.
November 6, 10 a.m. - 5 p.m.
Friendswood Fine Arts is proud to announce the 7th annual Art in the Park Outdoor Art & Music Festival, October 15t-16. This event features exceptional artisans, live music, entertainment and art demonstrations set in beautiful Stevenson Park in Friendswood Texas. All activities are free to the public. October 15, 10 a.m. - 8 p.m.
October 16, 11 a.m. - 5 p.m. The downtown festival is one of the top 10 outdoor fine arts festivals in the nation. The two-day festival showcases the works of over 300 of the finest artists and craftsmen in the world. The outdoor event brings out more than 20,000 people into the heart of Downtown Houston offering visitors the opportunity to meet with exhibiting artists, and enjoy food and entertainment. Located in Downtown Houston surrounding City Hall, Hermann Square, Houston Public Library, Sam Houston Park, and adjacent streets. ​October 1, 10 a.m. - 6 p.m. The Pecan Street Festival is one of the largest, and longest-running, arts/crafts and music festivals in the nation presented by The Pecan Street Association, a 501(c)4 nonprofit organization. Sept 24, 11 a.m. - 10 p.m.
​Sept 25, 11 a.m. - 8 p.m.
Friday, April 29, 11 a.m. - 6 p.m.
Join us as we celebrate 45 years of fine art with more than 350 artists at the Bayou City Art Festival in Memorial Park on April 29 - May 1. Festival patrons will enjoy a vibrant walk through Memorial Park as they take in the sights of artwork from 19 different disciplines and enjoy an array of delicious, local foods. Access to park by shuttles buses only. ​Six blocks of Main Street in the Deep Ellum entertainment district, 2900-3400 Main Street, Dallas TX 75226, will be transformed into one enormous street festival. Featuring 200 top-notch decorative and visual artists, 100 original bands and singer/songwriters performing from four different stages, the renowned Pet Parade, and enticing foods and drinks. Friday, April 1, 11:00 a.m. - 11:00 p.m.
Saturday, April 2, 11:00 a.m. - 11:00 p.m.
Sunday, April 3, 11:00 a.m. - 8:00 p.m.
​The 6th annual Friendswood Art in the Park Festival is set for Saturday, November 14 from 11 a.m. to 8 p.m. and Sunday, November 15 from 11 a.m. to 5 p.m. at Stevenson Park, located at 1100 Friendswood Dr. Visitors will enjoy talented artists and musicians, along with great food, live artist demonstrations, and free art activities. 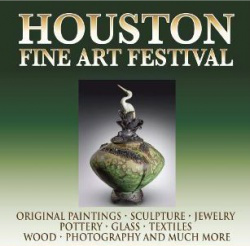 ​Sunday, November 15, 11 a.m. to 5 p.m.
Graciously hosted by Discovery Green, the Houston Fine Art Festival showcases the art of national and regional artisans. The event is set on Jones Lawn in the center of Discovery Green. As you walk the grounds you will have the extraordinary opportunity to choose from spectacular artwork in painting, photography, sculpture, metalwork, digital art, jewelry, glass, ceramics, woodworking – and more. Meet the artisans that create the works - artisans are available throughout the event. Saturday, 10 a.m. - 5 p.m. & Sunday, 12 p.m - 6 p.m. Besides browsing for one-of-a-kind buys, visitors to this spring fine arts festival will enjoy live music, artist demonstrations and fun art activities for aspiring artists of all ages. Admission to the festival is free and open to the public. The Bosque Gallery at Lone Star College–CyFair is a teaching gallery whose primary mission is to provide exhibitions which support and enrich college curriculum, events and programs. The Bosque Gallery provides exhibition opportunities for our visual arts students, and opportunities to view original artwork by fellow art students, our visual arts faculty and professional artists. Thursday, September 17, 4:30 - 6:30 p.m. I will be showing my Real WhimFansical art at the Bosque Gallery at Lone Star College-CyFair.